Two of the highest profile classes of horses a trainer will have in his barn are maidens and 3-year-olds. A relatively high percentage of maiden special weight wins indicates a trainer who has the ability and team to manage inexperienced horses and get their careers off to a good start, while the ability to successfully manage 3-year-olds is high on most owners' lists. 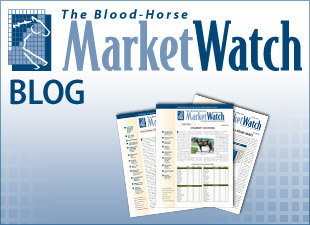 Each year BloodHorse MarketWatch publishes detailed statistics on the top 100 North American trainers by earnings (ranging from $23,134,394 for Chad Brown to $1,853,011 for John Toscano Jr.). This section will appear in the March 18 edition of BloodHorse. Among these top trainers, we carved out the leaders by percentage of MSW wins and 3-year-old wins from starts in the respective categories to see which trainers have found success in both categories. 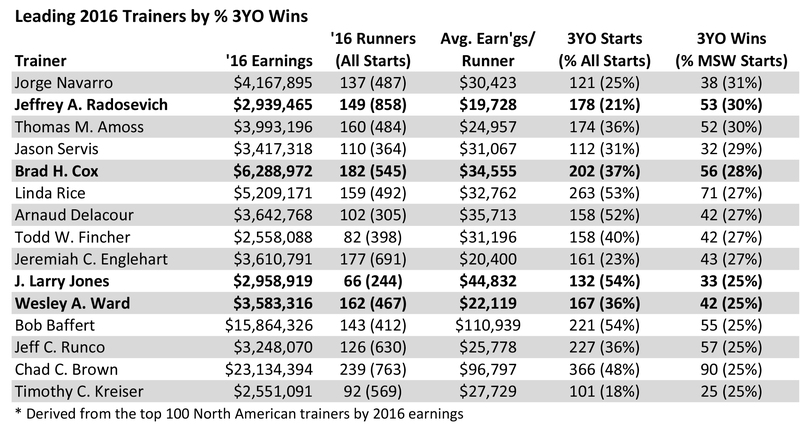 With 3-year-olds, we identified 15 trainers with 25% or more wins in 2016. Then we sorted the list to identify 12 trainers with 25% or more MSW wins. Four trainers appeared on both lists: Brad Cox, Larry Jones, Jeff Radosevich, and Wesley Ward. Midwest-based Radosevich, had the highest win percentages in both categories among the four trainers highlighted here, with 39% MSW wins from 41 starts and 30% 3-year-old wins from 178 starts. Radosevich began training in the fall of 1993 after a 14-year career as a jockey. The 55-year-old Richfield, Ohio, resident has 2,209 wins and career earnings of nearly $24 million. His top 3-year-old of 2016 was Loooch Racing Stables' Mo Dont No, who won the Steel Valley Sprint Stakes and the Best of Ohio Endurance Stakes. Brad Cox leads the group of four by total 2016 earnings with $6,288,972. Cox, who began training in 2004, has 28% 3-year-old wins from 202 starts and 27% MSW wins from 101 starts. His top 3-year-olds included multiple stakes winners Cash Back and Extra Credit. Jones leads the quartet by average earnings per runner with $44,832 out of 66 runners. He had 27% MSW wins from 70 starts and 25% wins with 3-year-olds out of 132 starts. In 2016 his top 3-year-olds were stakes winners He'll Pay, No Distortion, and Southern Girl. Jones, who began training in 1982, has 1,050 career wins and nearly $47.2 million in total earnings. Ward has enjoyed far more success with maiden runners than any of other three trainers. Out of his almost $50 million in career earnings to date, he's made more than $15.3 million with maidens. Ward had 26% wins out of 117 MSW starts last year and 25% wins out of 167 starts with 3-year-olds. His best sophomore of 2016 was Acapulco, who was a group 2 winner at 2 and a listed stakes winner at 3. Otherwise his top runners in 2016 were juvenile stakes winners Silvertoni, Con Te Partiro, and Red Lodge.